I thought I had it all figured out, given the number of times I’ve made oatmeal in my life. Overnight, hot, cold, lukewarm (ew), apple-pied, black sesame-ed, peanut buttered, I’ve done it all. 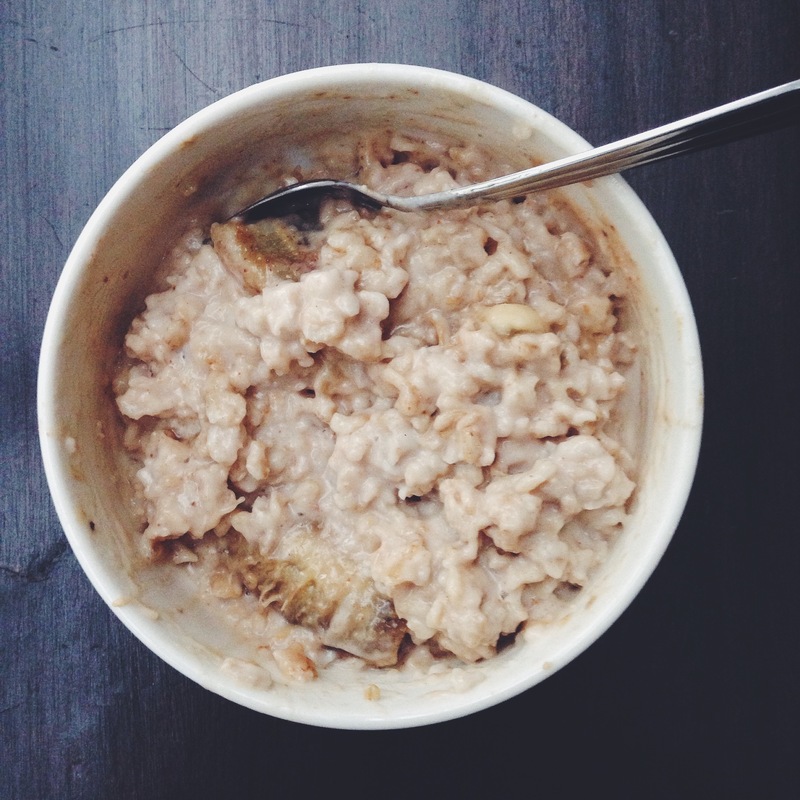 I even wrote a post about it here exactly a year ago, yet I only just discovered what I think is the perfect method for making the thickest, creamiest oatmeal ever. Trial and error does pay off sometimes. It’s more reliable, oats coming out perfect every time. Mind you, this method is preferable is you like the super thick and gloopy sort, but even if you don’t, you just have to take your oats out of the microwave a little earlier. Catch– it involves the microwave. I can hear the disappointed sighs. They’re boring into the screen already, reaching me, slaps in the making. I get it, I do. I used to think the only way to achieve the perfect, creamy consistency for oats is to do it the proper and old-fashioned stovetop way. The whole process just makes more sense, it wants you to feel like you’re doing it the better way, doesn’t it? Funnily enough, this microwave method not only yielded the most desirable consistency, it also seemed to enhanced the flavour of mashed banana, the one ingredient I always put in before cooking my oats for added sweetness and creaminess. The night before, mix together a half cup of rolled oats, half cup of water, half a mashed banana, and a half cup of milk of choice (I always use a mix of whole and almond) in a relatively large, microwave-safe bowl (because this mixture will se. Leave this in the fridge overnight. The next morning, put your bowl in the microwave and microwave on high for 2 minutes. Take a spoon and mix, then put in the microwave for another minute. At this point, your oatmeal should be noticeably more voluminous and thickened, depending on the power setting of your microwave. Microwave in 30-second increments until you have oatmeal that seems to have more than doubled in volume. Just check your oatmeal every 30 seconds, mixing well between each spurt of heating. Err on the side of caution here. And you’re done! At this point, you can add whatever you want. My standard toppings are more banana, a heaping tablespoon of almond butter (cashew/peanut/almond), blueberries for a nice tang to cut through the sweet goop, and plenty of honey or maple syrup. Once the oatmeal is a little cooler, I also add a dash of cold, whole milk. BUT. In this case, I highly recommend trying out this kaya and coconut twist. It’s the sort of combination I’ll be coming back to again and again, for the flavours are close to my heart and it’s a nice break from your typical snack of kaya and butter toast! You should now have a thick, creamy, voluminous mass in your hands. Take the other half or a whole banana and slice it down the middle. Butter a hot pan and fry the banana on both sides. 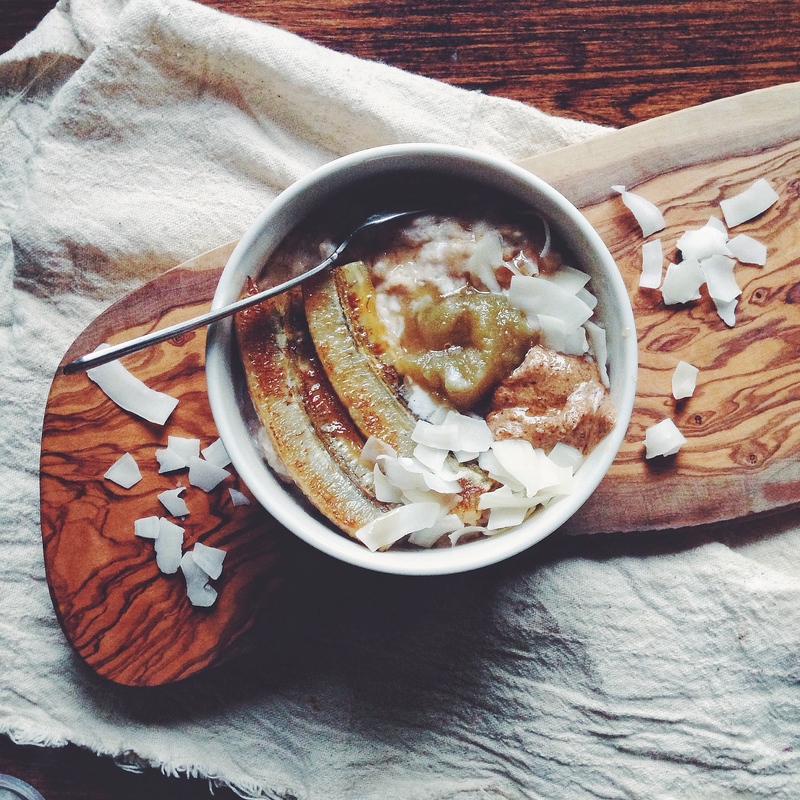 Place the caramelised banana on top of the oats, then add a heaping tablespoon each of almond butter and kaya (I love Breadtalk or Yakun, and my grandma makes a mean one too), a generous drizzle of maple syrup, coconut flakes and a dash of whole milk. Mix everything together, admire the glorious mess, then tuck in happily.